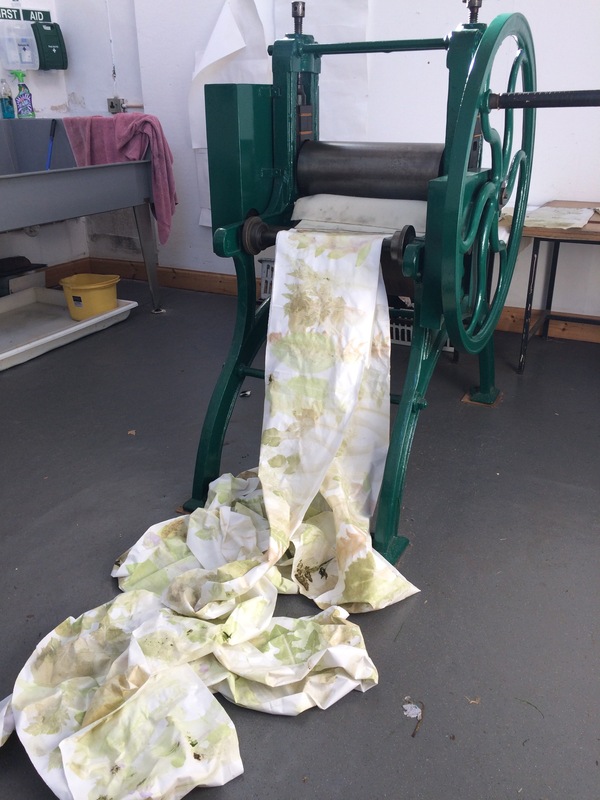 Tina Scopa experiments with printing on a long piece of fabric. © Tina Scopa, all rights reserved. Tina Scopa found a way to make plants draw themselves. A biochemical engineer-turned-artist, Tina discovered that plants can ‘draw’ themselves after repeatedly experimenting with printmaking techniques. Her experimentation resulted in prints that evoke thought and emotion, and in prints that are surprisingly detailed representations of living plants. Currently a student at Duncan of Jordanstone College of Art & Design in Dundee, Scotland, Tina brings attention not only to plants but to the soil in which plants grow. Because she includes both plants and soil in her work, she calls her work Edaphic Plant Art. Please join me in welcoming Tina Scopa! 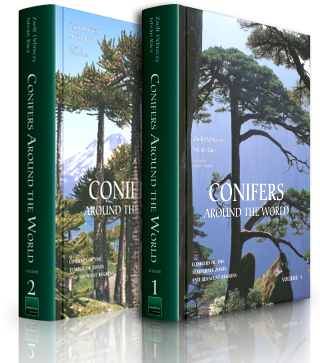 Of or relating to the physical and chemical conditions of the soil, especially in relation to the plant and animal life it supports. Tina Scopa: I started working with soil last year when I began a personal project not quite knowing what it was going to be about. I started drawing circles almost unconsciously and became curious about that act, wondering if it was, in fact, a very basic, primitive gesture that humans do instinctively. Exploring this idea of following intuitive, primitive impulses I was drawn to the earth and the desire to be outside and feel the earth. (I had an allotment at the time and was enjoying growing vegetables and working with the soil). Moving on to the work I was doing this year on a small, wild patch of ground I realised I wanted to know more about our knowledge of soil. I was fortunate enough to discover that a short soil science course was just about to begin within the geography department. It was there that I learned the term, edaphic I hadn’t heard this before and was intrigued by the word. I had been wondering how to label my work, thinking of land art, earth art, ecological art, botanical art. None of those descriptions really seemed to adequately define the work I was making, then the idea of ‘Edaphic Plant Art’ popped into my head and I knew that was what it was about. AP: I was looking at the photo of your exhibition studio space, specifically the grid of images. It looks like your photographs are ‘habitat’ shots, while your pigment prints, graphite prints, and ink prints each focus on a single element. How do you choose what to present in the prints you make? Do you have set ideas in mind or does the printing process dictate the type of prints you make? TS: With this work you refer to I specifically wanted a view of the plant existing in its habitat. It was a very general image without focusing into it too much or making a very detailed image of the plant. The thinking behind this was to present an image of what we mostly overlook and don’t pay much attention to. By placing this image beside the detailed prints of the individual plant I wanted to say something like, ‘Wow look how beautiful that little plant is. Is that it growing in there?’. As for choosing what prints to present, my desire in this work was to present, for comparison, the different print techniques I had developed. I chose 5 plants to do this with – nettle, vetch, buttercup, yarrow, and grass. However, I felt the graphite prints of this work weren’t as refined as they could have been. AP: You also create ‘earth’ paintings and feature soil samples in your shows. What message do you hope to relay to visitors viewing your earth paintings and soil samples? How do you make sure this message gets across to them? TS: I’ve already described how working with soil came about and initially I was thinking a lot about how we would have made paints from the earth pigments in the past. Now after learning more about soil science I have become aware that we are living in a time of depleted soils. The nutrient content of soils has dropped significantly in recent times and this is translated into the food grown in these soils with reduced nutrient content, impacting on our own health and nutrition. The depth of soils has dropped drastically with the use of liquid fertilisers and intensive, mechanised ploughing. I’ve learned that our soils really are in crisis and yet we are not generally aware of it at present. I haven’t yet conveyed this through the work other than talking about the significance of the ‘paintings’. The other thing I realised through attending the soil science lectures was that although I am very interested in the soil and want to know more, most of the science left me disappointed. There’s a big focus on how to calculate the moisture content of soils because that is of economic importance. Yet what is it that I really want to know about soil? And how do I want to conduct a study of soil? These are questions I don’t yet know the answer too. It is definitely something more sensory, experiential, intuitive, perhaps even poetic. I suppose one other thing that needs to be said on this topic is that when I began the soil work I had an almost reverential regard to it. It needed to be significant somehow so I selected soil from a site that had ancient standing stones. I dried it, ground it, and sieved it to create a very fine powder. I turned this into an oil paint and then worked with it to paint a torso-sized circle by hand that I refined and refined almost meditatively, hardly breathing. My intention was to repeat this on a much more refined and meticulously prepared gesso board using the earth from the wild flower patch. The earth painting from this patch was going to be done after all the plant prints. When I got to this point I discovered that this soil had in fact been brought in from a contractor and the plants themselves had been sown from a wildflower seed mix. (There was also an intact cobbled road underneath it all, I was told!). At the time this felt like a devastating and shocking discovery. It wasn’t at all this wild, unnoticed patch full of undiscovered beauty but a bought and managed piece of earth! Why did this seem so wrong to me? We have been managing the land for centuries, moving earth, buying and selling it and sowing seeds. This knowledge prevented me from the reverential painting I had initially intended and instead I rubbed this wet earth onto the board by hand. I then felt the need to do the same with a ‘healthier’ soil taken from another location where it had had time to develop. I presented these with soil samples in small porcelain cups I had made. The other message I’d like to get across is just how awe inspiring the natural world is. The forms and colours of largely overlooked wild plants can reveal great beauty if we slow down and ‘tune in’ to notice this wonder. We can enrich our lives by holding these beautiful forms in reverence. We have lost so many of our natural meadows through intensive agriculture and through that I believe we’ve lost a beauty and experience that once nourished us. AP: In the article you wrote for the Living Field website, you state your interest in using your printing techniques as scientific tools. How do you envision your techniques contributing to the work of soil scientists, botanists, and others? TS: What I can see with my prints is exactly where pigment is located within the structure of the plant. I can see where it begins and ends and can see even small areas of pigment. As far as I understand it, the scientific study of plant pigments removes leaves, for example, and grinds them to see the quantities of pigments by spectrophotometric means but doesn’t show the exact location within the plant. I would like to know more about this. One of the things I often see is a small area of blue pigment where the stem meets the root. I recently read that Theophrastus, a Greek who was the first to attempt to categorise plants believed that the soul of a plant was located where the stem meets the root. I love the idea that this blue pigment is the visualisation of the ‘soul of the plant’! The other use I envision for my prints is akin to the traditional herbarium. Instead of using the dried, pressed plant I believe the print would provide an accurate (and beautiful) record of the plant. AP: Your pigment prints make me think of the books about flower pounding. Only your work is far more elegant and descriptive. How do you achieve such grace and detail in your prints? TS: This is largely luck! Yet selecting the right plant at the right time and using the right pressure can make it into an art that relies on experiential knowledge. For every successful print, there are many disappointing results. AP: When you create your graphite and ink prints, are they the result of plants making direct contact with graphite and ink or do you prepare plates using material like ImagOn, for example? TS: I wasn’t aware of ImagOn. The prints I make use the plant directly. I have also briefly tried some traditional zinc or steel plate etchings that used the plants directly. Some trials I did with photopolymer etching and waterless lithography used only the digital image of the plant, yet I prefer the textural quality my prints have through the use of the actual plant rather than a digital image. I was recently part of a print exchange with Nova Scotia College of Art & Design in Canada. My own prints are all monoprints and in an attempt to produce a print run for this exchange I tried the waterless lithography technique with a digital image of one of my monoprints. I found the results very disappointing in comparison to my own. Admittedly it was my first attempt with this so they might have been improved. Later, finding out about the photopolymer etching technique and trying this out, I realised that this would probably have been more successful. (The work was shown from the 4-8th July this year in an exhibition entitled, ‘Resources’ at the Anna Leonowens Gallery in Halifax, Nova Scotia). AP: The decision you made to present plant species observed in a small patch of grass made me think of the book series, One Small Square, which encourages children to study the diversity of life within one square foot. What suggestions do you have for classroom teachers and informal science educators who may want to use nature printing or flower pounding as a way to enhance student understanding of what they observe in a small square of garden, lawn, etc.? TS: I love the idea of this series and again wasn’t aware of this. I run very simple workshops using spoons to press the plants. Children seem to love them and if reluctant adults can be persuaded to give it a go, they are usually hooked too. The wonder of seeing the plant pigments on the paper seems to fascinate and generates the desire to see ‘what that one looks like, and that one…’. There are lots of surprises – a pink flower might produce a purple or blue print, white flowers can print brown. The colours change too as the season changes. Seeing the beautiful forms and delicate colours of these little, overlooked weeds can bring a whole new relationship with the natural world. It can enhance weeding and turn something unwanted into something beautiful to marvel at. At an event recently I bumped into a parent who had previously attended a workshop. 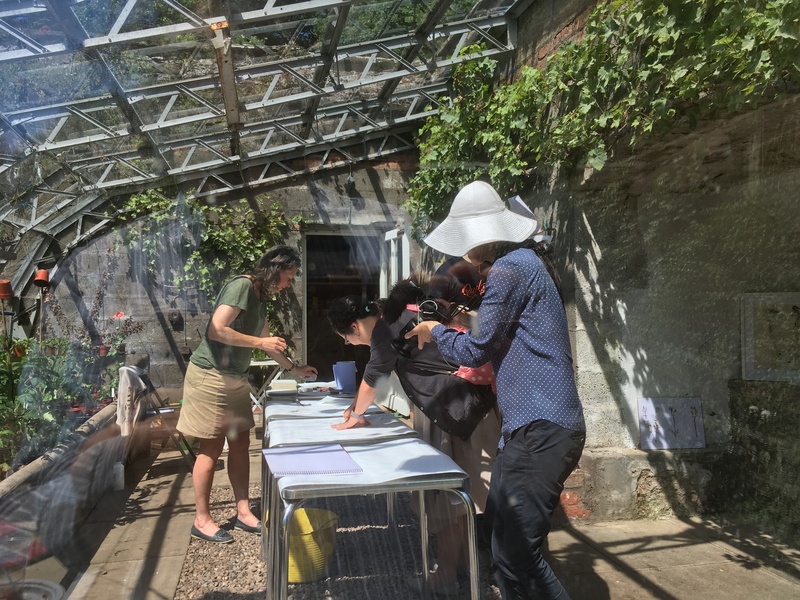 It was great to hear him tell me that although his children are very engaged with technology, since the workshop they’ve been having moments of putting down the iPads etc., running into the garden for weeds saying, ‘get the spoons’! Friday, July 28, 2017. Please enter your questions and comments below. Tina’s classes are now posted at Classes Near You > Scotland. Tina Scopa prepares for her workshop. Image courtesy Tina Scopa. 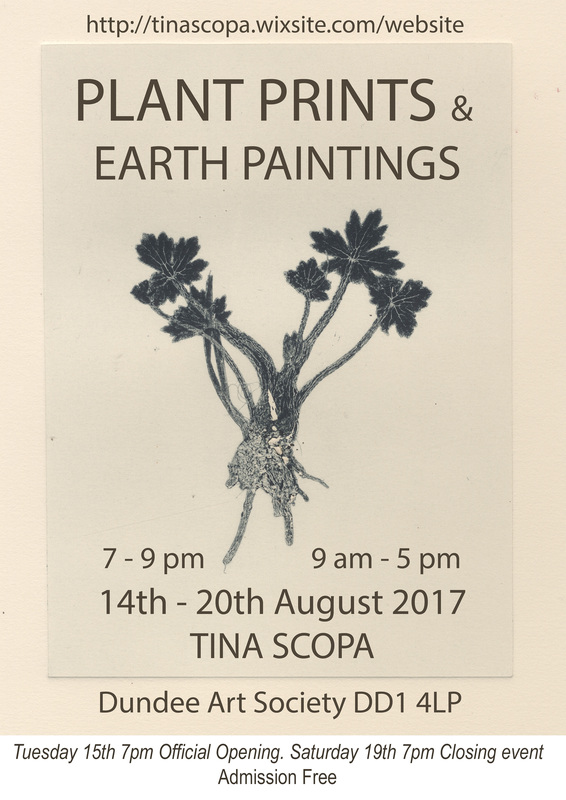 plant printing workshops suitable for most ages and abilities, although some strength and dexterity are required. In the future, she plans to teach short courses about how people can learn about the world through a contemporary art practice. Tina’s work will be on view in three upcoming exhibitions. Flyers for two of them are below. 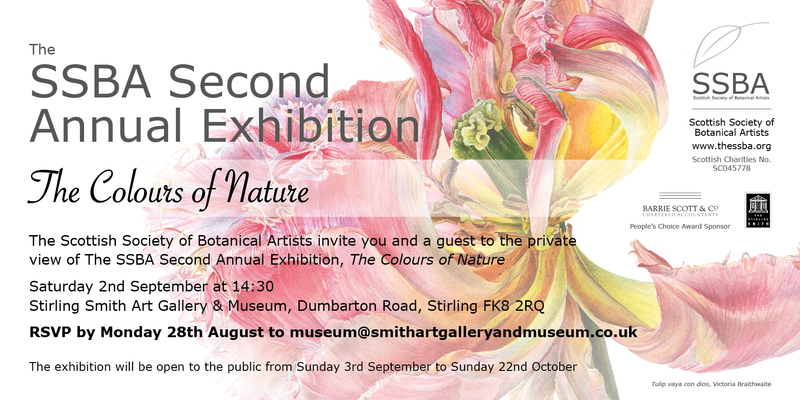 A third exhibition will open in December at the Dundee Botanic Garden.